Genomic diversity based on 4 STR loci, CSF1P0, TPOX , TH01 and FGA is studied in Gond, Bhil and Brahmin populations of the Madhya Pradesh, India. The 161 blood samples analysed for the present study. For this study samples was collected from Betul (Gond), Bhil and Brahmin (Neemach and Mandsaur). The population wise average Ho/He ratioat four STR loci amongst the three studied population was calculated as 0.979 for Gond, 1.016 for Bhil and 1.029 for Brahmin population of Madhya Pradesh. All loci fall under Hardy-Weinberg equilibrium except TPOX. These STR loci were highly informative and discriminating with Power of discrimination values of all tested loci was above 80%. Highest PD values were obtained by FGA locus in all studied populations about 95%. Keywords: CSF1P0, TPOX, TH01, FGA and Hardy-Weinberg equilibrium. Chaudhary Ruchira and Batav Nitin (2019) Genomic diversity in Madhya Pradesh, India: Genetic relationship among three ethnic populations from Madhya Pradesh based on STR polymorphism, Int. J. of. 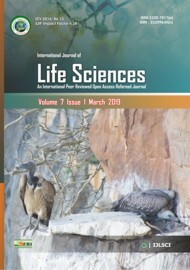 Life Sciences, Volume 7(1): 61-69. Authors are thankful to Director and Dr. Pankaj Shrivastava State Forensic Science Laboratory, Sagour, MP, India for providing genotyping facility. Authors also thankful for all subjects who gave blood samples for this study. Afzal M, (1984) Effects of Consanguinity on Reproductive Fitness and Certain Behavioral Traits among Bihar Muslims. Ph.D. thesis, Bhagalpur University, Bihar, India. Basu A (1996) The Pahira: A population genetical study. American Journal of Phyical Anthropology, 31: 399-416. Bhasin MK, (1985) Genetic studies in four tribal Populations of the Surat district, Gujarat (India). Annals of Human Biology, 12: 27-39. Bittles AH and Hussain R, (2000) An analysis of consanguineous marriage in the Muslim population of India at regional and the state levels. Annals of Human Biology, 27:163–171. Chaubey G, (2010) The demographic history of India: A perspective based on genetic evidence. Universitatis Tartuensis, Estonia. Ph.D Thesis, 9–81. (http://hdl.handle.net/10062/15240). Chaudhari RR and Dahiya MS (2014) Genetic diversity of 15 autosomal short tandem repeats locus using the AmpFLSTR® Identifiler™ kit in a Bhil Tribe Population from Gujarat state, India. Indian Journal of Human Genetics, 20 (2):148–152. Dubey B, et al., (2009) Forensic STR profile of two endogamous populations of Madhya Pradesh, India. Legal Medicine, 11:41–44. Eaaswarkhanth M, et al., (2009) Microsatellite diversity delineates genetic relationships of Shia and Sunni Muslim populations of Uttar Pradesh, India. Human Biology, 81: 427-445. Excoffier L, et al., (2007) Arlequin (version 3.0): An integrated software package for population genetics data analysis. Evolutionary Bioinformatics Online, 1: 47-50. Gaikwad S and Kashyap VK (2002) Polymorphism at fifteen hypervariable microsatellite locus in four population of Maharashtra, India. Forensic Science International, 126:267–271. Ghosh T, et al., (2011) Genetic diversity of autosomal STRs in eleven populations of India. Forensic Science International Genetics, 5(3):259–261. Imad H, et al., (2014) Genetic variation of twenty autosomal STR loci and evaluate the importance of these loci for forensic genetic purposes, African Journal of Biotechnology, 13 (11): 1210 – 1218. Kashyap VK, et al., (2004) Genetic Structure and Affinity Among Eight Ethnic Populations of Eastern India: Based on 22 Polymorphic DNA Loci. American Journal of Human Biology, 16:311–327. Kaur M and Badaruddoza (2014) Genetic Polymorphism of Five STR Markers among Four Groups of Punjabi Population in North-West Punjab, India. International Journal of Human Genetics, 14(1): 1-7. Lanchbury JS, (1996) Genetic differentiation and population structure of some occupational caste groups in Uttar Pradesh, India, Human Biology, 68:655-678. Malhotra K C (1978 a) Microevolutionary dynamics among the Govdas of Goa. In Evolutionary Models and Studies in Human Diversity, (R.J. Meier et al, eds), The Hague, Netherlands: Mouton, PP. 315–323. Malhotra KC (1978 b) Founder effect, gene drift and natural selection among four nomadic mendelian isolates. In Evolutionary Models and Studies in Human Diversity, (R.J. Meier et al eds), The Hague, Netherlands: Mouton, PP. 279–314. Namita M, et al., (2000) Congruence of genomic and ethnolinguistic affinities among five tribal populations of Madhya Pradesh (India), Journal of Genetics, 79 (2): 41-46. Nei M, (1972) Genetic distance between populations. American Naturalist, 106:283–291. Peakall R and Smouse PE (2006) GENALEX 6: Genetic analysis in excel. Population genetic software for teaching and research. Molecular Ecology Notes, 6: 288-95. Reddy B M, et al., (2001) Diversity at Three Tetrameric STR Loci in a Substructured Golla Caste Population of Southern Andhra Pradesh, in Comparison to Other Indian Populations: Kamla-Raj 2001 International Journal of Human Genetics, (2): 101-108. Sahoo S and Kashyap VK (2002) Genetic variation at 15 autosomal microsatellite locus in three highly endogamous populations of Orissa, India. Forensic Science International, 130:189–193. Sarkar N and Kashyap VK (2002) Genetic diversity at two penta nucleotide STR and thirteen tetranucleotide STR locus by multiplex PCR in four predominant population groups of central India. Forensic Science International, 128:196–201. Sharma G, et al., (2012) Genetic affinity of the Central Indian Tribal Population. PLOS ONE, 7(2): e32546. Shrivastava P, et al., (2013) Autosomal STR genotyping Analysis of juvenile delinquents of Madhya Pradesh: A pilot study. Advanced Biotech, 13: 20-24. Shrivastava P, et al., (2015a) Genetic polymorphism study on 12 X STR locus of investigator Argus X STR kit in Bhil tribal population of Madhya Pradesh, India. Legal Medicine, 17: 214–217. Tandon M, et al., (2002) Genomic diversity at 15 fluorescent labeled short tandem repeat locus in few important populations of State of Uttar Pradesh, India. Forensic Science International, 28:190–195. Takezaki N, et al., (2010) POPTREE2: Software for constructing population trees from allele frequency data and computing other population statistics with Windows interface. Molecular Biology Evolution, 27: 747-752. Tereba A, (1999) Tools for Analysis of Population Statistics . Profiles in DNA, 2, 14–16..